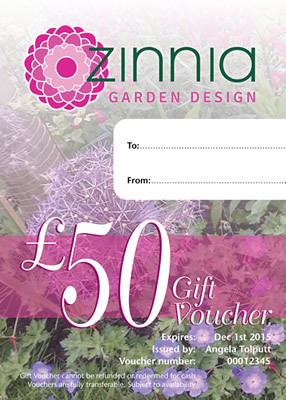 For Christmas, a special birthday, a wedding present, anniversary or a mother’s day gift, why not treat them to a garden consultation, a professionally designed garden border, a garden revamp or a complete garden design. The voucher can be redeemed throughout the year after issue and can be used to pay for any of our services including part payment towards a service. Step 1 - Choose the value that you would like to give, click the BUY NOW button and print a copy of your PayPal receipt. If you’d rather post a cheque payment please phone first on 01787 212264. Step 2 - We’ll need the recipients name, the special occasion (Birthday, Anniversary, etc) and your name and phone number, so simply email these to us from the Contact Us page. Step 3 - The voucher can be redeemed throughout the year after issue and can be used to pay for any of our services including part payment towards a service. if you have a query or for more information please call us on 01787 212264. Please read our Terms and Conditions of voucher issue below. The voucher can be used as part payment towards any of the services we offer. No cash or goods alternative is available and the voucher is non-transferable. The voucher must be redeemed within 12 months of the issue date. No reminder will be sent.